I am a raging fan of chick-flicks. I have a huge selection of them that are constantly in rotation in my DVD player. My poor husband. ;-) I am not too terribly picky when it comes to chick-flicks. I love most girly things that I watch, or I find things, scenes, characters, or accessories to love enough that I watch the movie over and over again. 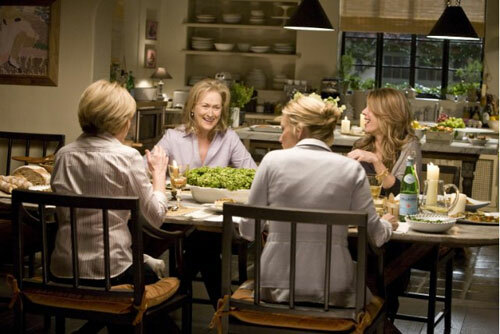 But among my favorite movies, there is a common thread -- they are all Nancy Meyers movies. 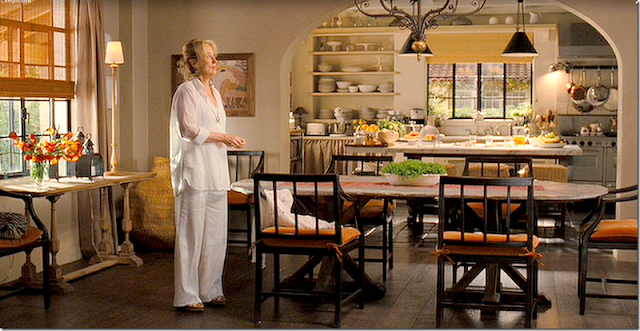 In this month's Elle Decor magazine, I stumbled across a mini article about Nancy Meyers and her work. She is a master at set design, and all of her creations are executed in the most beautiful, elegant, and delicate way. 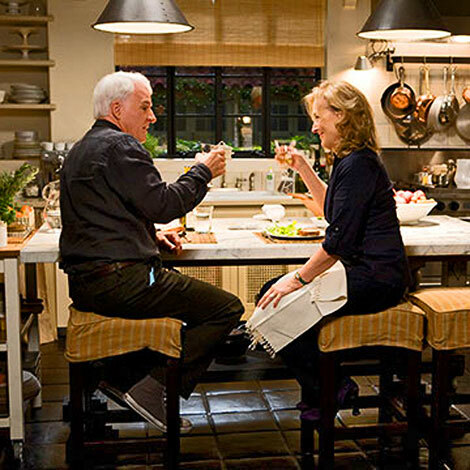 I loved a part of the piece where she said that she loves her job so much because she can't redecorate her home every couple of years, so instead she gets her design fix with her movies. :-) That made me smile. This is a woman with an impeccable eye who truly loves what she does -- and it shows. 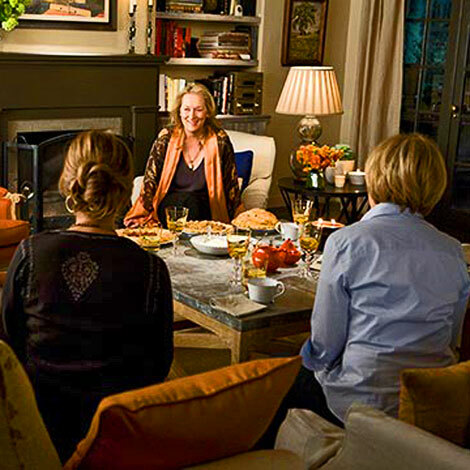 I thought that once a week for the next several weeks, we could dive into some of my favorite movie interiors that all have the Nancy Meyers theme in common. :-) I had such fun gathering the photos for these posts, and I can't wait to share them all with you! We'll look at the Father of the Bride all-American decor; the cozy, warm cottage from The Holiday; the contrast between the London and Napa homes in The Parent Trap; and more! It'll be fun, and I'm so glad to have you with me! I absolutely adore this movie -- it's definitely in my top three favorites. Meryl Streep is so wonderful in her role as mother of three, ex-wife of one truly adorable Alec Baldwin, and blooming 'girlfriend' to lovable Steve Martin's character, Adam. 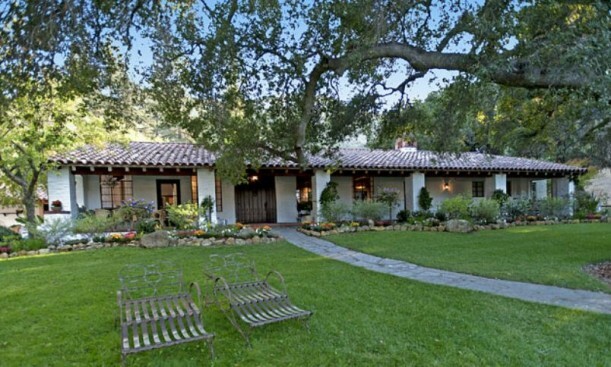 This beautiful ranch-style home is where she resides, and the inside is even more gorgeous than the outside! The living room -- a warm place with beautiful built-in bookshelves and a fabulous furniture set-up perfect for conversing. I love how the chairs seem to 'talk' to one another. 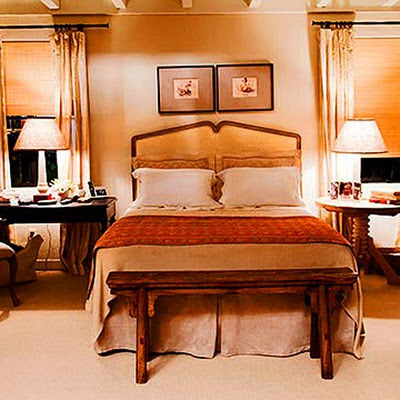 And of course, those luscious beams on the ceiling -- they really cozy up this space! 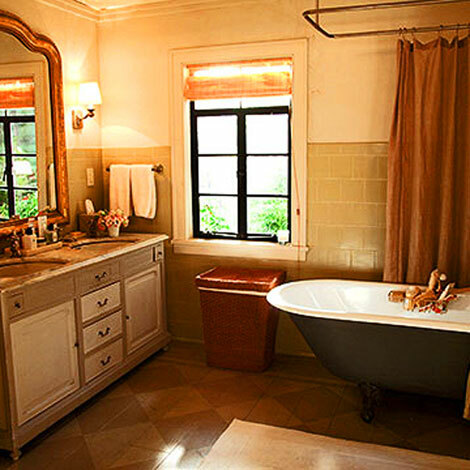 A lovely, traditional bathroom complete with a claw-foot bathtub. There is something so sweet in this room's simplicity. It is almost to the point of shabby chic, which I love, but still maintains a really well-planned and put-together look. 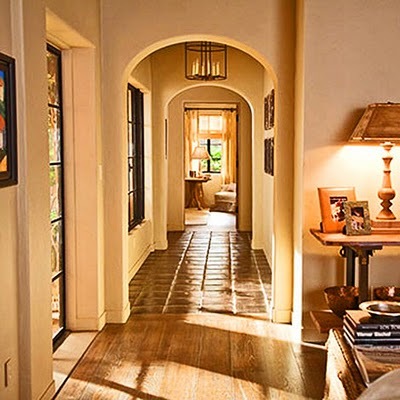 A stunning hallway with archway after archway. I love the visual effect of looking through many doorways, which end up leading into the final doorway of a room at the end of the hall. Such great design! And that chandelier? LOVE! Okay, don't even get me started on this kitchen. I am in deep love here. Chaos meets utter perfection; I just can't get enough of the open shelving to display all of the creamy white dishes contrasting with the copper and stainless steel metals of the pans on the opposing side. I love galley kitchens, and this one is fabulous because it is open on both sides -- easy entry and exit! The upholstered butter yellow barstools -- simply delicious. 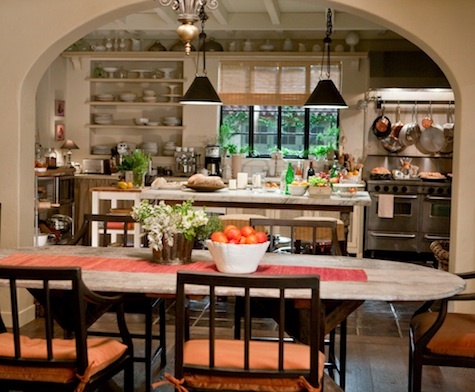 I love this dining room that lays right outside of the kitchen. Another archway stands between the rooms to give them a separated feel without there needing to be a door -- essentially keeping the floorplan open and airy. 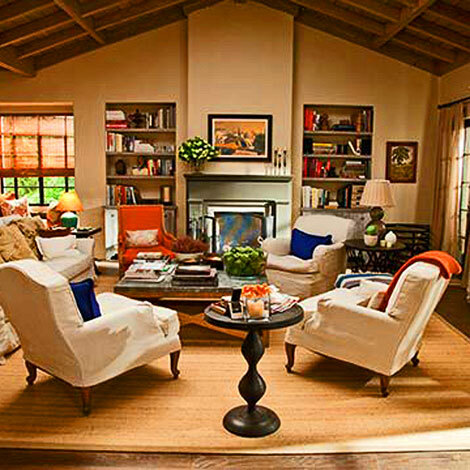 I love the burnt orange seat cushions -- adding warmth to a white room with accessories and furniture. 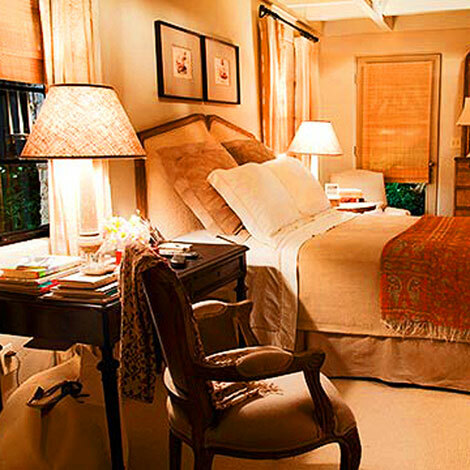 I'm totally loving the symmetry in this room with subtle differences like the side tables and the lamps. The colors are, again, warm (like the rest of the home!) and the contrast really works beautifully. And the wooden bench at the foot of the bed? I cannot get over how simply awesome that is. What is your favorite room of this home? Have you seen It's Complicated? Is it one of your favorites, too? I LOVE all of Nancy Meyer's movies! I watch them over and over and over again! And I am in love with this beautiful home...everything about it is just perfect.